It’s hard to imagine Mark Zuckerberg or Sheryl Sandberg wearing a black eyepatch and stroking a cat while overseeing the covert operation to overthrow America’s government. The people at Facebook, for all their flaws, don’t seem like the villains in a James Bond movie. And, for what it’s worth, they may very well have our best interests in mind. Who knows? But Facebook isn’t people, it’s more akin to a country, and a large one at that with over two billion citizens. It wasn’t always a country. The social network was driven first by Zuckerberg’s ego, then briefly by the talent of its team. But it wasn’t about people then either. When the brains at Facebook were figuring out how to create the best experience for users they stumbled upon a man-made natural resource that was as unexplored as the vastness of our galaxy: personal data. It’s because of this resource Facebook went from a college dropout’s personal project to an advertising platform reaching more than two billion users. Most of us haven’t spent much time trying to figure out how Facebook makes its money because we’ve never paid to use it. But it’s damn sure never been free. As we’ve said before, Facebook should be paying us to use its platform. So far, Facebook has gotten by convincing us that it’s techno-wizardry just found a way to turn something into nothing. We’re fine believing in alchemy as long as we’re all liking and sharing without any apparent consequences. In the face of the Cambridge Analytica news, however, this ‘something for nothing’ rhetoric is taking a beating. At best, the company’s been ignorant. And you don’t want your valuable personal data in the hands of a bunch of ignorant technologists. At worst, the social network is complicit in the hijacking of an American presidential election both through giving away user data to Cambridge Analytica and through selling data and advertising space to the Internet Research Agency, a troll farm sanctioned by the Russian government. Giving unbridled access to the user accounts of 50 million Facebook users sounds like the kind of thing Equifax would accidentally do, except when Facebook does it the company is 100 percent aware of what’s going on. And that’s a problem because the US government willfully chooses to avoid punishing either. If the social network were ‘people’ then ‘they’ would be doing everything possible to give us control over our data, simply because it’s ours. And if it was a ‘business’ it would have to worry about shareholders, a board, fines, breaking the law, or at least losing money. Facebook is not worried about money. It lost $60 billion in value overnight and nobody seems to be even the slightest bit concerned. It’s not a business we can deal with in the traditional sense: it’s a country you can’t bomb that’s run by an autocrat who, short of committing a violent crime, is as above-the-law as you can get without being Steven Segal. It’s worse when you take the macro view, because as tax payers and patriots we don’t want to admit our governments are powerless against the likes of Facebook. But they are. Perhaps you’re thinking: what about Twitter, Alibaba, Amazon, or Microsoft? 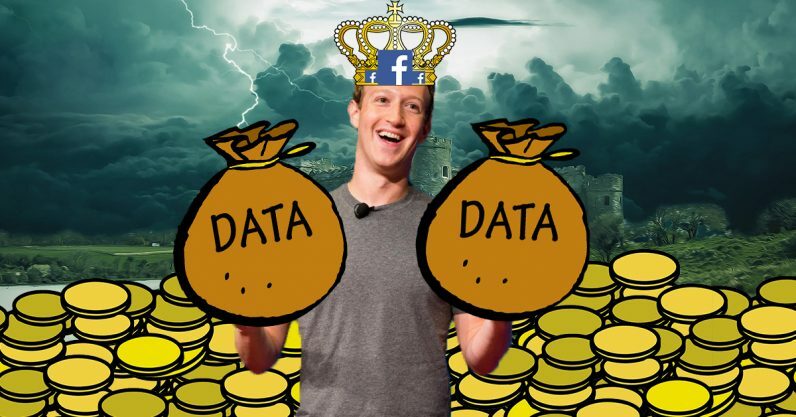 It’s true, all the big tech companies collect data and use it to fuel profits. You don’t have to be an investigative journalist to know that Amazon probably has as much data on you as Facebook, maybe even more. But Facebook’s data is unique and so is the way it’s used. The social network is a closed economy with an end-to-end solution for data harvesting that is completely centralized. Amazon is trying to sell you something. In fact, Amazon is trying to sell you everything. At the end of the day both Amazon and Alibaba are companies that sell products to you. Facebook, on the other hand, isn’t selling you anything because you’re the product. You can’t fight Facebook’s technology because it’s locked away under trade secrets, too complex for politicians to understand, and defended by better lawyers than The Justice Department can afford. And you can’t simply opt out, #DeleteFacebook is only going to get you so far. As TNW’s Alejandro Tauber pointed out, it’s hard to do and even if you don’t have an account the company has data on you. No, the only way to take on Facebook is to treat it like a country. We need an ethical uprising against the misuse of our personal information and we need both politicians and business leaders to pressure Facebook into being a good ally for democracy. Trying to hold Mark Zuckerberg legally accountable for his company’s ethical missteps is a minefield. Instead, we should consider making it expensive for other companies to do business with Facebook until it decides to protect our data or use it ethically.